Scribblenauts is a very creative game series where you can type in any word to make it appear on screen, and then you use what you create to solve puzzles and overcome obstacles in a 2-D platform world. Later games in the series even let you join forces with DC superheroes! And now you can play against each other in this multiplayer party entry Scribblenauts Showdown! It’s available for PS4, Switch, and Xbox One, but reviewed on PS4 here. The whole thing kind of reminds me of a mix of Mario Party and Scattegories! There are a few modes of play in the game. In Versus mode, you and a friend compete in a selection of mini-games in a row, and whoever wins the most is the victor. There is also a Showdown mode for one to four players. In this mode, you travel around a board game-like area, and draw cards at your turn. Cards can say things like ‘move this number of spaces if you win this mini-game’ and such. Whoever gets to the end of the board game first, wins. In both these modes you can choose to play short, medium, or long rounds. The mini-games you play in both these modes are split into two categories. Speedy and Wordy. Speedy games don’t require you to type in any words at all, they’re just strictly simple action games. You might have to relay a ball back and forth in tetherball or throw a flying disc in a Pong like challenge. Or other simple things like play a short rhythm game, cooking challenge, or blow up balloons by waving the controller around. The other type of mini-game are Wordy games. These play similar to the Speedy games in that they are mostly simple action fare, but at the start of each game you have to type in a word that you can use as an item in the game to help you out. So if you are trying to topple someone’s tower, you’ll want to type in a word that’s something heavy or explosive. If you’re running a hurdle race, you’ll want to type in something fast to ride on. But you can’t just type in anything, because before you start, you’ll have to cycle through a roulette of categories or letters of the alphabet to start with. Of course I don’t know if this always makes sense, because one time when playing against the computer and we were doing the hurdle races, the letter we had to start with was F and I chose ‘ferret’ while the CPU chose to ride Father Time. And the CPU won. But later when I played the same game against my brother, the letter was H and I chose Horse and he chose Hamster, and he still won! One thing I do know if you play the Medieval Mayhem battle stage and you get R as your starting letter, make sure to type in Rocket Launcher for an easy victory! By the way, the game’s dictionary has more than 35,000 words you can type in. Wow! 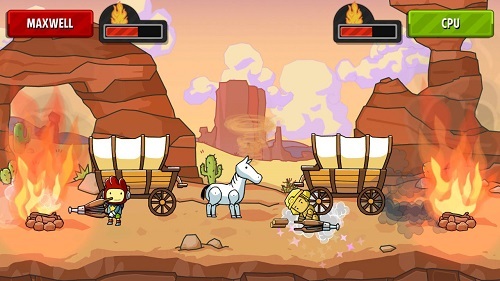 There is also a Sandbox mode which plays more similar to the regular Scribblenauts games. You’ll go to a small 2-D area where you can type in anything you want to appear. There are people and animals in this mode who may have requests, and if you type in what they want, they may give you Starites. Use Starites to unlock things (more on that later). One to two players can play Sandbox mode. Even though most of the game is multiplayer-centric, you can enjoy all the modes with just one player as well. You can also view which trophies and accomplishments you’ve unlocked in the Rewards screen and toggle features in Options. Lastly you can create your own Scribblenauts character to play as in the games. Use starites to unlock characters and accessories to customize your player, although sometimes you have to perform certain tasks to unlock things as well. The only problem I had with the game isn’t really a problem, just something I had to get used to. In past Scribblenauts games, you typed in words by pulling up a keyboard, and in here, you type in words by using the face buttons and pointing with the left stick. Kind of reminded me of how you type in words on an old telephone. But once I got used to it, it wasn’t so bad. If you enjoy Scribblenauts games and have a lot of people around to play with, you’ll definitely want to check out Scribblenauts Showdown! Scribblenauts Showdown is rated E-10 with ESRB descriptors of Cartoon Violence and Crude Humor. Since you can type in anything you want, really the game is only as violent and crude as you make it. You can fight people with rocket launchers or rice balls. If you do get hit by a weapon and lose all your hearts, you’ll just explode and disappear and everything looks like a child’s notebook doodles so the violence is only cartoony anyway. There is one mini-game where you must each as much of whatever food you typed in, and if you don’t press the button to swallow, you can throw up and the game does show that. Even if younger players can still enjoy the Speedy mini-games that require no reading, kids who can read and spell will enjoy this game the most. And since the game encourages reading and spelling skills, not to mention creativity, the game could be considered somewhat educational as well. WB Games sent me Scribblenauts Showdown for review purposes. I think I saw this on Game Pass for Xbox One today. Sounds cool. I may check it out as I’ve always wanted to play a game in this series.